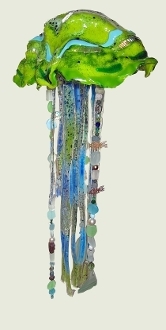 This is a hanging sculpture of a jellyfish. I've added loads of detail in the dome of the fish and the tentacles. There are also 3 strands of glass beads that add all sorts of visual fun. They are all one of a kind, like all my work, but this is the general idea of what you'll get. One of a kind piece measures approximately 9" wide and 2 feet long.